Facebook commerce is here. 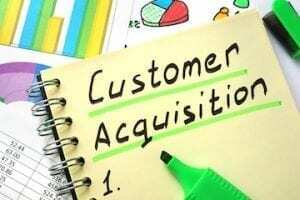 But what is sold on Facebook, and how it is sold, is still up in the air. 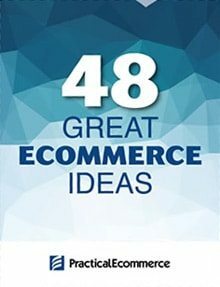 Here is a list of the 51 most popular — based on the number of “Likes” — Facebook pages with stores. For the purposes of this article, a page is considered to have a “store” if there are items for purchase on display. Many of the stores redirect purchases to other websites, while others stores are entirely within Facebook. 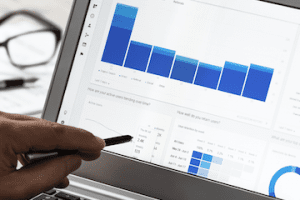 The ranking data is current to Tuesday, May 10, 2011, as analyzed by All Facebook’s Page Statistics, an unofficial Facebook page tracker updated daily. Across the stores, there is a broad spectrum of development, and merchandise. My personal favorites are the Harry Potter crystal ball and the Bon Jovi framed gold records. Browse the stores to see what they sell and how they sell it. 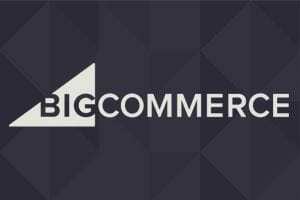 Take this list as a snapshot of the f-commerce market, not an accurate representation of it — the number of Likes is unlikely to be a good proxy for store sales. Lady Gaga (Musician/Band). The Lady Gaga store sells music, apparel, and accessories including Lady Gaga designed chrome headphones. 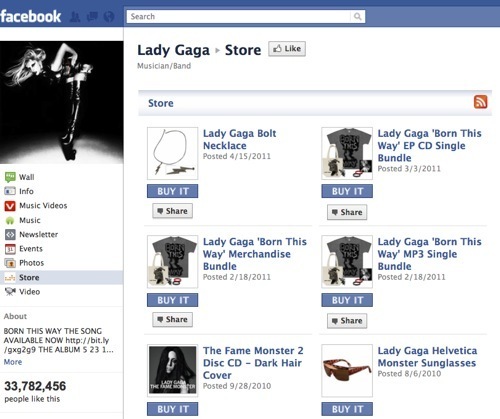 Purchasing redirects potential customers to the Lady Gaga official store website. Ranked 4 overall with 33.6 million Likes. Michael Jackson (Musician/Band). The Michael Jackson store sells apparel, Michael Jackson puzzles, a Michael Jackson Colorforms play set, posters, Michael Jackson rubber bracelets, and figurines. Purchasing redirects potential customers to the Michael Jackson official store website. Ranked 6 overall with 32.5 million Likes. Rihanna (Musician/Band). The Rihanna store sells apparel, jewelry, and novelties, such as Rihanna mouse ears and Rihanna blinking light stick. Purchasing redirects potential customers to the Rihanna official store website. Ranked 7 overall with 32.2 million Likes. Linkin Park (Musician/Band). The Linkin Park store sells a VIP concierge service for the band’s concerts, as well as music and apparel. 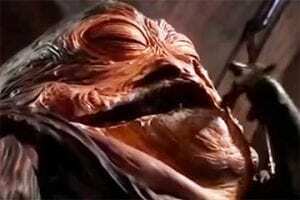 Transactions are within Facebook. Ranked 10 overall with 27.2 million Likes. Justin Bieber (Musician/Band). The Justin Bieber store sells music, apparel, headphones, toy bears, trading cards, and a Justin Bieber photo heart charm necklace. Purchasing redirects potential customers to the Justin Bieber official store website. Ranked 11 overall with 26.7 million Likes. Katy Perry (Musician/Band). The Katy Perry store sells apparel, posters, and a songbook. Purchasing redirects potential customers to the Katy Perry official store website. Ranked 16 overall with 24.2 million Likes. (Musician/Band). 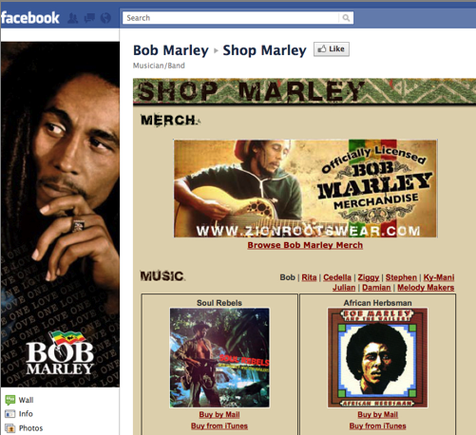 The Bob Marley store sells music by mail or download, as well as apparel, and Bob Marley cigarette papers. 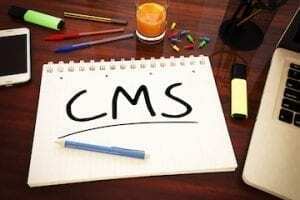 Purchasing redirects potential customers. Ranked 17 overall with 24 million Likes. Lil Wayne (Musician/Band). The Lil Wayne store sells apparel, as well as Lil Wayne tour shot glass. The Lil Wayne page also sells a VIP concert service. Purchasing redirects potential customers to the Lil Wayne official store website. Ranked 18 overall with 24 million Likes. Harry Potter (Movie). The Harry Potter store sells books, Blu-rays, DVDs, and soundtracks. Also there’s a wide selection of merchandise, including prop replicas, film cells, glassware, home decor items, stationery, figurines, maps, and wands. Transactions are within Facebook. Ranked 21 overall with 22.8 million Likes. (Musician/Band). The AKON store sells music through links to iTunes. Ranked 24 overall with 21.9 million Likes. Taylor Swift (Musician/Band). The Taylor Swift store sells an extensive collection of clothing, music, headbands, posters and pictures, books, stationery, jewelry, and a guitar. 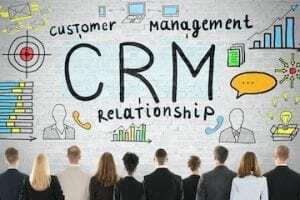 Purchasing redirects potential customers. Ranked 31 overall with 20.5 million Likes. David Guetta (Musician/Band). 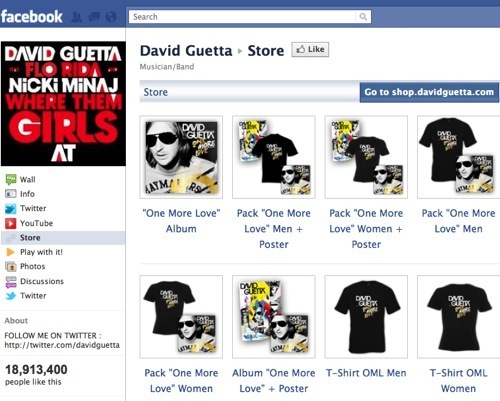 The David Guetta store sells music and apparel. Purchasing redirects potential customers. Ranked 39 overall with 18.9 million Likes. Usher (Musician/Band). The Usher store sells apparel, tote bags, tour buttons, posters, and iPhone skins. Purchasing redirects potential customers to the Usher official store website. Ranked 43 overall with 17.8 million Likes. (Musician/Band). With U.S. and U.K. versions, The Beatles store sells music, apparel, iPhone skins, mugs, pens, key chains, The Beatles Trivial Pursuit game, and Yellow Submarine baby strollers. Purchasing redirects potential customers. Ranked 46 overall with 17.4 million Likes. Mafia Wars (Games/Toys). Download dozens of popular Facebook games, review products and more — all for free. Ranked 48 overall with 17 million Likes. Paramore (Musician/Band). The Paramore store sells music, apparel, and accessories, such as a sticker book, sunglasses, and a locket. Purchasing redirects potential customers. Ranked 56 overall with 15 million Likes. (Musician/Band). 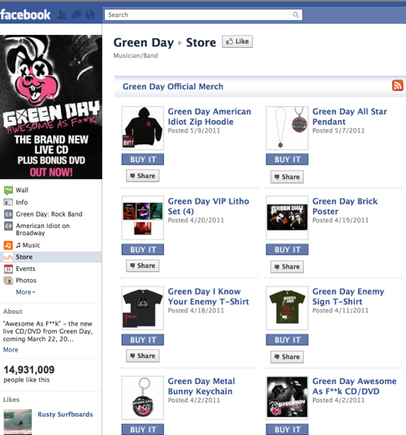 The Green Day store sells music, apparel, posters, keychain, and a pendant. Purchasing redirects potential customers. Ranked 57 overall with 14.9 million Likes. iTunes (Product/Service). iTunes doesn’t sell anything on Facebook, but it does allow users to download free songs. Also, it has a menu of selected artists, all linking to the iTunes store. Ranked 59 overall with 14 million Likes. PlayStation (Product/Service). Featuring interactive ads for the latest video games on the console. 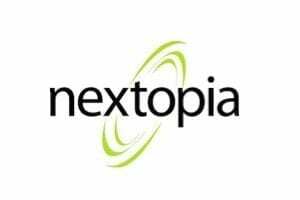 Allows users to get free bonus items that they can use during game play when they purchase the product at participating retailers. Ranked 60 overall with 13.8 million Likes. Grey’s Anatomy (TV Show). The Grey’s Anatomy store sells T-shirts and apparel, drinkware products, and home and gifts products, such as the Dr. McDreamy apron. Transactions are within Facebook. Ranked 62 overall with 13.6 million Likes. Victoria’s Secret (Clothing). Although Victoria’s Secret does not sell its products on Facebook, it does sell gift cards through Facebook that can be redeemed online and in stores. Ranked 67 overall with 12.9 million Likes. Jackass (Movie). 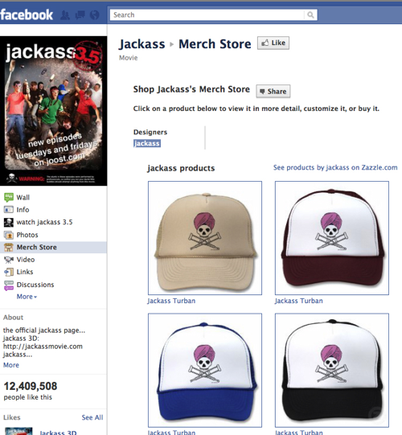 The Jackass store sells apparel. Purchasing redirects potential customers. Ranked 74 overall with 12.4 million Likes. Kesha (Musician/Band). The Kesha store sells T-shirts and an official button pack. Purchasing redirects potential customers. Ranked 77 overall with 12.2 million Likes. Bon Jovi (Musician/Band). The Bon Jovi store contains an extensive selection of merchandise, with categories including ladies’ and men’s apparel, iPhone skins, greatest hits merchandise, and memorabilia, including limited edition gold record replicas. Purchasing redirects potential customers. Ranked 78 overall, with 11.9 million Likes. Jersey Shore (TV Show). The Jersey Shore store sells DVDs, apparel, and novelties, such as the Smush Room board and a grenade whistle. 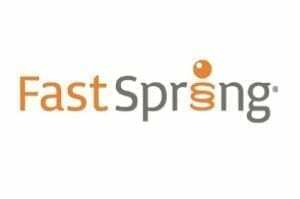 Purchasing redirects potential customers to Amazon.com. Ranked 86 overall with 10.9 million Likes. Britney Spears (Musician/Band). Although Britney Spears does not have a store page, there is a navigational menu for purchasing music and concert tickets. Also there is a banner ad with a purchase link for her perfume. Purchasing redirects potential customers. Ranked 92 overall with 10.4 million Likes. Red Hot Chili Peppers (Musician/Band). The Red Hot Chili Peppers store sells T-shirts, hoodies, and a military patch. Purchasing redirects potential customers. Ranked 100 overall with 9.7 million Likes. 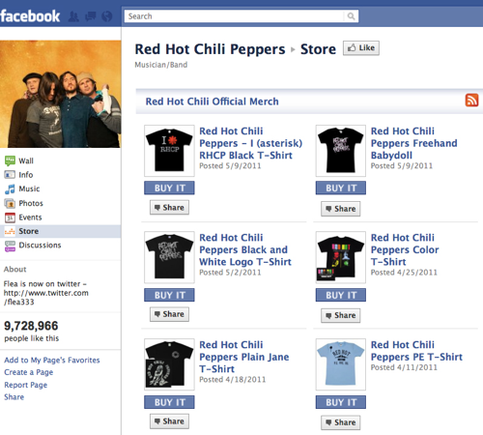 Red Hot Chili Peppers Facebook store. Muse (Musician/Band). The Muse store sells apparel, jewelry, songbooks, a sticker set, a messenger bag, and an album button set. Purchasing redirects potential customers. Ranked 102 overall with 9.6 million Likes. Nirvana (Musician/Band). The Nirvana store sells T-shirts and a jacket. Purchasing redirects potential customers. Ranked 102 overall with 9.5 million Likes. Saw (Movie). The Saw store sells DVDs and Blu-rays of “Saw: The Final Chapter.” Purchasing redirects potential customers to Amazon.com. Ranked 121 overall with 8.9 million Likes. U2 (Musician/Band). The U2 store offers an extensive selection of music, DVDs, apparel, and lithographs of album artwork and band images. Purchasing redirects potential customers to the U2 official store website. Ranked 130 overall with 8.5 million Likes. NBA (Sports League). 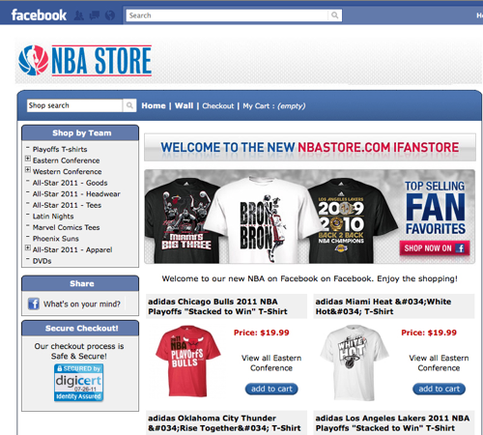 The NBA sells a large selection of apparel, goods such as a Spalding NBA All-Star basketball, and Michael Jordan DVDs. Transactions are within Facebook. Ranked 132 overall with 8.5 million Likes. Dexter (TV Show). The Dexter store sells DVDs, apparel, bobbleheads, and novelties, such as a Dexter costume, Dexter Evidence Remains floor mat, and Dexter syringe-pen. Transactions are within Facebook. Ranked 143 with 8.1 million Likes. Jay-Z (Musician/Band). The Jay-Z store sells T-shirts, Jay-Z Yankee Stadium commemorative pennant, and the Jay-Z Official Decoded Book. Purchasing redirects potential customers. Ranked 145 with 8 million Likes. Desperate Housewives (TV Show). The Desperate Housewives store sells apparel, drinkware products, and home and gift products, such as the Desperate Housewives gym bag. Transactions are within Facebook. Ranked 148 overall with 7.9 million Likes. Jason Mraz (Musician/Band). The Jason Mraz store sells music, T-shirts, a tote bag, a songbook, and a book of photographs by the artist. Purchasing redirects potential customers to the Jason Mraz official store website. Ranked 150 overall with 7.8 million Likes. System of a Down (Musician/Band). 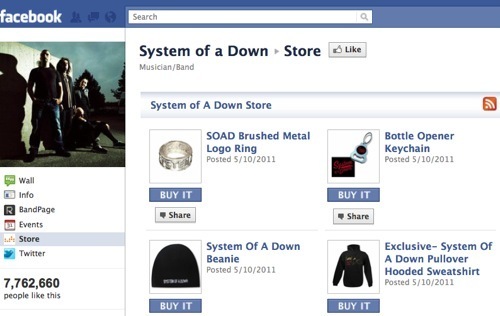 The System of a Down store sells T-shirts, a beanie, a band logo ring, and a band bottle-opener keychain. Purchasing redirects potential customers to the band’s official store website. Ranked 155 overall with 7.8 million Likes. System of a Down Facebook store. Lost (TV Show). Similar to the Desperate Housewives store, the Lost store sells apparel, drinkware products, and home and gift products, such as the Who Is The Leader beach tote bag. Transactions are within Facebook. Ranked 162 overall with 7.4 million Likes. The Doors (Musician/Band). The Doors store sells music, related apparel, posters and books. Albums are available in vinyl. Purchasing redirects potential customers. Ranked 169 overall with 7.2 million Likes. Avenged Sevenfold (Musician/Band). The Avenged Sevenfold store features apparel, such as the Avenged Sevenfold skull-chain wallet and a guitar pick necklace. Purchasing redirects potential customers the band’s official store website. Ranked 180 overall 6.8 million Likes. John Cena – WWE Universe (Athlete). The John Cena WWE Universe store sells apparel, DVDs, action figures and novelties. Purchasing redirects potential customers to the WWE online store. Ranked 202 overall with 6.3 million Likes. Johnny Cash (Musician/Band). 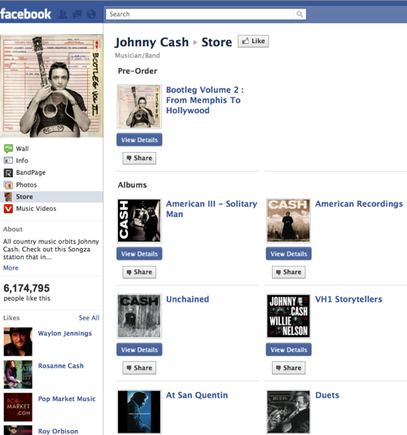 The Johnny Cash store sells music. Purchasing redirects potential customers. Ranked 205 overall with 6.2 million Likes. Jeff Dunham (Public Figure). The Jeff Dunham store sells books, audio books, DVDs, Blu-rays, and dolls. Purchasing redirects potential customers. Ranked 214 overall with 5.9 million Likes. Radiohead (Musician/Band). The Radiohead store sells apparel, as well as the Crying Minotaur In Eye Popping 3D stuffed animal, made from recycled materials. Purchasing redirects potential customers. Ranked 219 overall with 5.8 million Likes. Owl City (Musician/Band). The Owl City store sells music, apparel, and an owl stuffed-animal. Purchasing redirects potential customers. Ranked 220 overall with 5.8 million Likes. Arsenal (Professional Sports Team). The Arsenal store sells sports uniforms, practice apparel, online TV subscription services, hospitality packages, gifts and souvenirs, and soccer school. Purchasing redirects potential customers. Ranked 225 with 5.7 million Likes. Slash (Musician/Band). 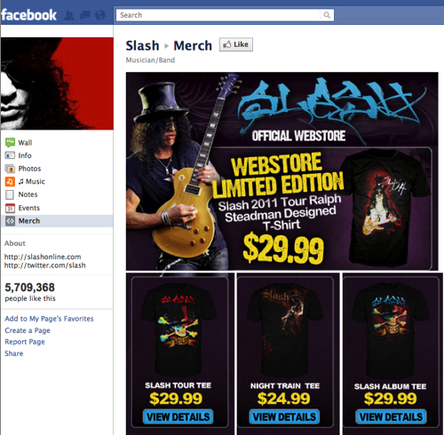 The Slash store sells T-shirts. Purchasing redirects potential customers. Ranked 226 with 5.7 million Likes. Supernatural (TV Show). The Supernatural store sells DVDs, the show magazine, and a show companion book. It also contains a link to the official online store at WBshop.com. Purchasing redirects potential customers. Ranked 230 overall with 5.7 million Likes. Liverpool FC (Professional Sports Team). The Liverpool FC store sells sports uniforms, practice apparel, online TV subscription services, hospitality packages, gifts and souvenirs, and soccer school. Purchasing redirects potential customers. Ranked 239 overall with 5.5 million Likes. Disturbed (Musician/Band). The Disturbed store sells apparel and novelties, including Disturbed bottle opener, Disturbed ghost-face backpack, and Disturbed engraved dog tags. Purchasing redirects potential customers to the band’s official store website. Ranked 241 overall with 5.5 million Likes. George Lopez (Comedian). The George Lopez store sells George Lopez “Donate Life” Awareness bracelets, apparel, a latte mug, a mouse pad, a spiral notebook, and a pencil set. Purchasing redirects potential customers. Ranked 250 overall with 5.5 million Likes.